Another sad day for wildlife lovers as yet another one of the world’s beautiful creatures is declared extinct. The Alaotra grebe from Madagascar was added to a growing list of modern day extinctions of bird species, nearly 190 total out of the 10,000 bird species remaining in the world. I shudder to think how the threatened and endangered list will change with this terrible oil spill in the gulf. As "mdr" explained recently in, astroid found guilty of killing dinosaurs that a panel of scientists, after reviewing all evidence, blame an asteroid impact for the demise of the dinosaurs. 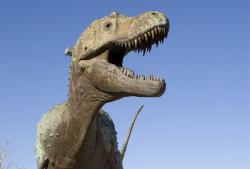 A paper has just been published saying that dinosaurs choked on ozone. 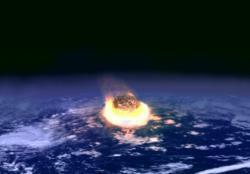 A new study in the journal Paleogeography, Paleoclimatology, Paleoecology puts forth the idea that the Chicxulub impact, long blamed for the extinction of the dinosaurs at the end of the Cretaceous era 65 million years ago, could have done them in by flinging huge amounts of ozone precursor chemicals -- nitrogen oxides, methane, and other hydrocarbons -- into the air. Below the article in Discovery News, this comment by 1sang (Doug) explains why mammals and avians survived. In order to (survive) all you'd have to do is get on steeper slopes and find enough food to live for a couple of years. Mammals and smaller avian dinosaurs could more easily accomplish this than their massive cousins (in fact, many were probably already in this safety zone away from the many large predators roaming the lowlands). He also notes that methane release leads to an increase in ozone and that today we have the beginnings of lots of methane being released (I wrote about this here: Methane ice). Killer asteroid? 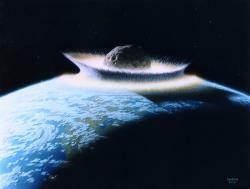 : Artist conception of impact eventCourtesy NASAThe old “What really killed the dinosaurs” controversy is back in the news. And once again, it’s Princeton geophysicist Gerta Keller stirring up the pot. Death from above? 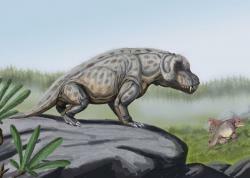 : Perhaps not.Courtesy Mark RyanKeller and her colleague Thierry Adatte of the University of Lausanne in Switzerland have published yet another paper challenging the prevailing theory that an asteroid was the major cause of the extinction of the dinosaurs at the end of the Cretaceous Period 65 million years ago. The extinction affected over 60 percent of animal species including all of the non-avian dinosaurs. Actually a number of events were occurring around the end of the Cretaceous including long-term volcanic activity, rapid marine regression, and the infamous asteroid impact. There’s also evidence that some of the dinosaur population was already in decline 10 million years prior to the events. But the scenario is usually played out with the meteor coming late in the sequence and delivering the deathblow to an already weakened eco-system, and paving the way for mammals to take over the ecological gap. K-T boundary layer: The Cretaceous-Tertiary boundary layer located near Trinidad, Colorado. 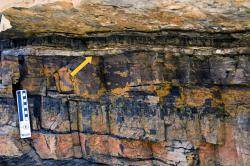 The pale-gray 1-inch iridium layer (arrow) is sandwiched between coal layers and contains shocked quartz and other evidence of a large asteroid impact. The scale bar is 6 inches in length.Courtesy Mark RyanThe asteroid impact hypothesis was first proposed in 1980 by Luis Alvarez of the University of California after he and his son Walter discovered a claystone layer rich in the rare-earth element iridium and peppered with shocked quartz in many locations around the world. Iridium is a rare element not commonly found on the Earth’s surface but abundant in meteorites. Shocked quartz was first noticed in sand grains in craters created by nuclear test bombs and later in meteor impact sites. Alvarez hypothesized that the only other possible source for this naturally deposited strata would be from a large extraterrestrial object hitting the Earth. From studying the amount of iridium found in Cretaceous-Tertiary (K-T) boundary formations, he calculated that a bolide about 6 miles across would have been necessary to create that much iridium around the world. But at the time evidence of such an was unknown. It wasn’t until after Luis Alvarez’s death in 1988 that a crater on the Yucatan Peninsula near Chicxulub Mexico became the chief suspect. The Chicxulub impact crater was the right size and the right age fitting all the criteria of a Cretaceous extinction event. But Keller claims the asteroid came too early to put the coup de grace on dinosaurs or any species for that matter. Her study of spherules in strata at localities in Mexico has convinced her that the asteroid collided with Earth 300,000 years before any mass extinction. At El Penon, a location very near the impact crater site, Keller and Adatte studied a 30-ft layer of sandstone above the iridium layer that they calculated had been laid down at a rate of about 1-inch per thousand years. This means it took 300,000 years to pile up the entire section of sediment. Fossils were analyzed on either side of the iridium layer and the researchers found that of 52 species counted below the iridium layer (meaning before the impact), the same 52 species were found above it, meaning the asteroid hadn’t caused any extinction. But at the top of the 30 feet of sandstone overlaying the iridium claystone things were different. The more likely culprit, according to Keller, is India’s Deccan Traps flood basalts which for several million years poured out tremendous amounts of lava and noxious fumes into the atmosphere that would have had put long and tremendous stress on the existing ecosystem. Keller seems to roll out a paper on the subject every year or so in the last decade. We covered some of her Deccan Traps research 2007 which you can read here. Whatever the case we do know is that non-avian dinosaurs left the planet after the Cretaceous, as none of their fossils have been found above the K-T Boundary. Well, even that doesn’t appear to be the case anymore. Recent dinosaur fossils found in the San Juan Basin in northwestern New Mexico are suspected to come from a stratum that post-dates the Cretaceous extinction. More research needs to be done on the find, but even this wouldn’t be unexpected. Even after the host declares the party’s over, there are always some stragglers who just don’t want to leave. Keller's paper was published this week in the Journal of the Geological Society. We post plenty of stories here on the Buzz telling the sad stories of impending, or completed, animal extinctions. Here's a great story on how over the past 50 years, Minnesota's surplus bear population has helped bring back Arkansas's nearly extinct bear population back from the brink. No word on what, if any, role Bill Clinton played in this effort. Man vs. mammoth: Is a face-off like this in our future...again?Courtesy redskunkScientists are another step closer to making Jurassic Park a reality. Well, not quite Jurassic Park, but certainly Pleistocene Park. Researchers at Pennsylvania State University have decoded 80 percent of the DNA for the woolly mammoth, an elephant ancestor that went extinct about 10,000 years ago. The results of their study appear in the journal Nature. The DNA was extracted from actual mammoth hair found preserved in the permafrost of Siberia. Hair encapsulates DNA, providing a purer source of the genetic material than that found in fossil bones that are vulnerable to contamination by bacteria and other creatures involved in decomposition. We covered this in a previous post. 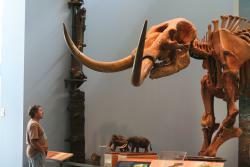 About six million years of evolution separate the wooly mammoth from its modern descendents the Indian and African elephants. And so far they appear genetically to be very similar, although a complete assessment of differences won’t be available until the complete genomes of mammoths and modern elephants are mapped. The data sets for each is comprised of about 4 billion DNA bases. But even then you don’t have to worry about rogue mammoths running amok on the interstates (have you ever hit a moose? Multiply that experience by about 15). Science is still decades away from cloning an actual specimen – or even a hybrid with a living elephant - from the genetic material. The technology just isn’t there yet. But that’s not the only thing in the way. 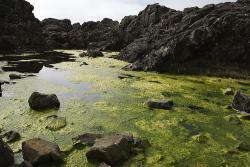 "It could be done,” said co-author Stephan Schuster, a biochemistry professor at Penn State. “The question is, just because we might be able to do it one day, should we do it?" Sounds familiar doesn’t it? The same question was posed by one of the characters in Michael Crichton's book Jurassic Park just before things got really hairy. Contrary to previous reports, the Chinese river dolphin may not yet be extinct. A man claims to have videotaped an animal which may be a member of this critically endangered species. Dinosaur 1: Hey, have you noticed that there seem to be a lot less of us these days? Dinosaur 2: What? I don’t know. Why? Dinosaur 1: Probably just my imagination. Forget about it. Dinosaur 1: Hey, what’s that thing up there? Dinosaur 2: We call it the sun. Dinosaur 1: No, that thing – it’s getting bigger, I think. Anyway, the extinction at the end of the Mesozoic (dinosaur times) was a big deal. But, dramatic as it likely was, it was nothing compared to the extinction at the beginning of the Mesozoic. Before the dinosaurs existed, the world was ruled by a different kind of animal, the therapsids, or “mammal-like reptiles.” These ranged from little rat like guys to huge fanged and clawed lion-like creatures. About 250 million years ago, though, at the end of the Permian period, there was an extinction event way bigger than the one that would eventually kill all the dinosaurs. The Permian extinction killed off 90% of all the life on the planet, both on land and in the oceans. Life as we know it just squeaked by complete annihilation. The thing is, scientists still aren’t sure exactly what initiated the extinction. Whatever it was, it caused massive amounts of carbon dioxide, and other greenhouse gases to be released into the atmosphere. The earth would have gotten warmer and warmer, the oceans would have become acidic, and by the time things got back to normal, almost every species on the planet had died out. Jonathan Payne, a paleobiologist at Stanford, is investigating one of the possible causes of the extinction – a massive volcanic eruption occurring at the end of the Permian. This eruption was the larger than any other that has happened in the last 600 million years, and it spread a four-mile thick sheet of basalt the size of the continental US over Asia. Along with the poisonous gases spewed by the volcano itself, it is believed that the spreading magma may have heated the coal-rich strata near the eruption and released vast amounts of carbon dioxide into the atmosphere. Then, you know, the whole horrible global warming and acidic oceans thing. Fortunately, for all our CO2 production, we aren’t yet in the Permian extinction league of global warming gases. Still, Payne is comparing contemporary signs of global warming to those leading up to the Permian event. For example, under increasing environmental stresses, coral colonies tend to bleach (as algae leaves the reefs). Researchers will be examining fossilized coral colonies from the end of the Permian to see how they reacted to the changing environment. "We hope to reconcile the short-term processes we observe operating in the modern world with the very long time scales seen in the geologic record," says a researcher in Payne’s lab. If the analogy works, we could better understand the processes of past environmental change, as well as the potential future effects of the environmental changes that are occurring today. My own theory regarding the Permian extinction largely focuses on the refusal of therapsis to carpool, and their insistence on driving larger vehicles than they really needed (cyconodonts were notorious SUV lovers). Unfortunately, this is extremely difficult to verify in the fossil record. I chalk this up to the poor preservation of pre-Triassic GM products, or, possibly, to the fact that therapsids had adapted to finding (and then losing) well concealed parking spots (they were, after all, much more primitive than us).